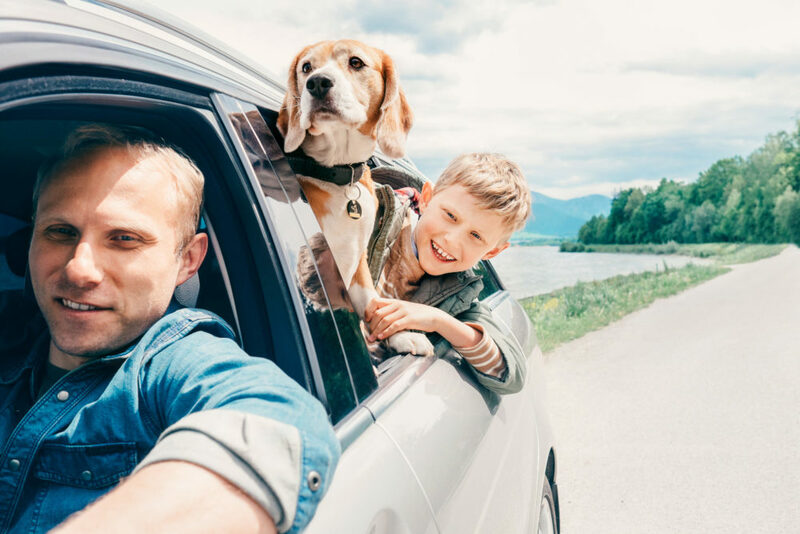 The most precious cargo your car will ever carry is your family, so naturally keeping the littlest members of your family safe is a top priority. We’ve put together a great guide to making sure car trips are safe and comfy for your little ones. In Australia, it is a legal requirement that everyone travelling in the car, young or old, must be wearing a seatbelt or appropriate child restraint. It’s especially important to pay close attention to restraint guidelines for children to ensure your whole family is safe, whether you’re on a long trip or just popping to the shops. A great way to demonstrate the importance of seat belts to children is to always wear a seatbelt yourself. Monkey see, monkey do! For babies aged up to six months, a properly fastened and adjusted rear-facing baby seat is required. Once your little one reaches six months old, they can graduate to a forward facing seat or remain rear-facing. Kids aged four and older can sit in a properly fastened booster seat, however it’s recommended that they remain in their baby seat until they reach the maximum weight specified. When buckling up, make sure there are no twists in the harness, and ensure the fit is firm enough by slipping two fingers in between the harness and your little one. Baby seats and booster seats should be placed in the back seat, where it is much safer in the event of an accident. For children under 4 years old, back row seating is legally required. For children over four, it is strongly recommended. Did you know that even on overcast days the internal temperature of a car can get to 20° higher than temperatures outside? This is one reason why it’s vital that children are never left alone in cars. On hot summer days, studies have shown that the temperature inside a parked car can reach a staggering 40° hotter than the external temperature – and most of this temperature rise occurs in the first five minutes! These temperature can become dangerous – and even fatal – for children very quickly. Children become dehydrated much faster than adults, and aren’t as able to regulate their body temperature as well. Throw in a hot, enclosed car, and you’ve got a recipe for disaster. It is illegal in all Australian states and territories to leave children and babies unattended in cars, regardless of the weather. So, if you need to leave the vehicle – even for a short time – make sure you take your child or baby with you. If you see an unattended child or baby in a car in a carpark, alert a nearby staff member. If the child looks distressed or overheated, call 000 immediately. Even if you’d never intentionally leave your child unattended in your car, when you’ve got a million things on your mind or you’re in a rush, accidents can happen. A great tip to make sure you never forget about your littlest passenger is to place your handbag, phone, or another item you always carry with you, in the back seat next to your baby. Some mum’s and dad’s even put one of their shoes in the back seat foot well – you’re guaranteed not to forget that when you get out of the car! A reminder that your child is with you – like their lunch box or bottle – placed on the passenger seat is another little hack that will help keep everyone safe. Making sure children and babies never play with the car keys is another way to prevent them accidentally locking you out of the car. If your child does accidentally lock themselves in the car with the keys, contact 000 as well as roadside assistance by hollering for a Marshall on 1300 627 742. Toddlers and small children can move quickly and quietly, and this can make driveways particularly dangerous. Small children may not yet realise that a moving car can be dangerous, and they often become engrossed in one activity and may not notice risks and dangers around them. When reversing out of the driveway, make sure all children are accounted for and always do a visual check of the surrounding area – don’t rely on inbuilt sensors and cameras. Getting into the habit of waving goodbye to family members as they stand at the door is a great way to make sure you always know the whereabouts of all family members. Always hold your child’s hand around vehicles, even if they vehicles are stationary. This is a good habit to get into, as it reinforces the importance of safety around cars at all times. Even holding hands as you just walk from the door to the letter box and back is great practice, and also prevents speedy little runners from getting away! Teaching Your Teen To Drive? Read This First!